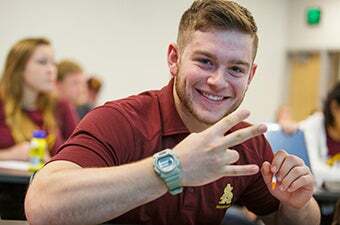 SPARKS is dedicated to increasing college readiness, awareness and enrollment of K-12 students at Arizona State University. SPARKS is a student-led service organization at Arizona State University promoting access to higher education throughout the community. SPARKS members inspire and motivate over 33,000 K-12 students per year to pursue and succeed in higher education by sharing their personal stories. Beyond serving as role models to Arizona youth, SPARKS members are provided with multiple networking and professional development resources to prepare them for success as students and young professionals. Are you a current Sun Devil interested in being part of our team? Learn more about SPARKS and their mission to commitment to near-peer mentoring in Arizona to share their path to college. SPARKS outreach inspires K-12 students to pursue higher education. Have a question about life as college student? Submit your question here. Access ASU prepares Arizona students for admission and success at ASU. Interested in scheduling a presentation or campus visit with SPARKS?